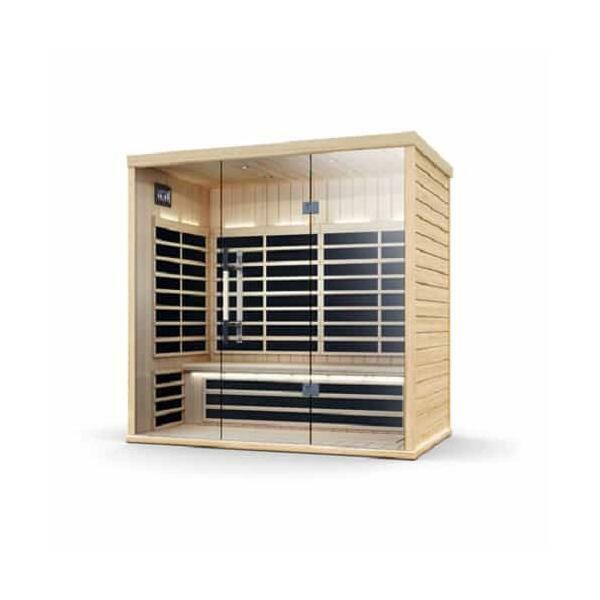 The S830 Sauna by Finnleo offers the time-proven benefits of a dry bath in a completely modern package. 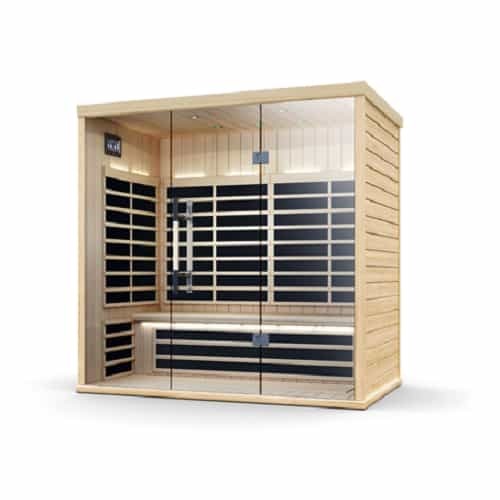 First of all, this Pure Infra sauna, with its EvenHeat system, delivers consistently steady heat to every area of your body; all you have to do is turn it on. The intuitive touch screen control allows you to make heat, light and sound adjustments with your fingertip. The S830 Sauna by Finnleo runs on a simple household outlet; just plug it in and start enjoying the many benefits of owning a sauna. This sauna is large enough to seat three people in complete comfort, or use it to enjoy some alone time; the ample bench will allow you to lay back and soak it all in. And the S830 has prefabricated wall panels and comes ready for easy assembly. Tempered glass doors lend a modern esthetic, while the Tri-Modal Lighting System offers three lighting options. Detoxification of heavy metals, pollutants, pesticides, food additives, and other environmental toxins. Builds the heart muscle and improves cardiovascular performance. Improves skin tone, cleanliness, and appearance. Relieves aches and pains from Arthritis, Fibermyalgia, and other muscular and joint ailments. Sinus and respiratory system improvement. Raises the body's white blood cell count (the immune system). Great for pain and recovery. Think muscles, joint stiffness, Arthritis, Tendonitis, ect. Lots of steam and aromatherapy. Excellent for sinus, skin, circulation, cardiovascular, immune system and detoxification.